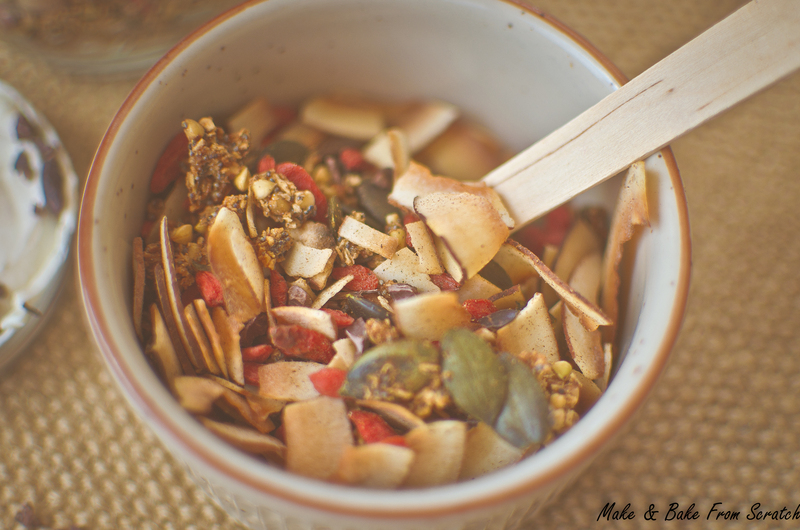 Homemade Crunchy Granola can either be devoured at breakfast or whenever the mood takes you, no set rules. I think it is like a trail mix too, so would work well when travelling/hiking as a snack. It is sweet, crunchy and when you are rooting around the press for a treat, this will help. This recipe is gluten-free, grain free and low in fructose. I eat it with applesauce and a tablespoon of peanut butter; you can use any nut butter. I bake 6-8 pink ladies then pop them in the food processor (with skins – good fibre source), blitz them. Add (1 tbsp.) cinnamon to enhance the flavour. Store the applesauce / butter in a glass airtight container in the fridge. You can add it to granola, pancakes, smoothies or cakes. Whatever tickles your fancy. Wondering what is inside this delicious, health creation? Buckwheat groats, desiccated coconut, pumpkin seeds, cinnamon, poppy seeds (add any seeds), rice syrup and coconut oil. 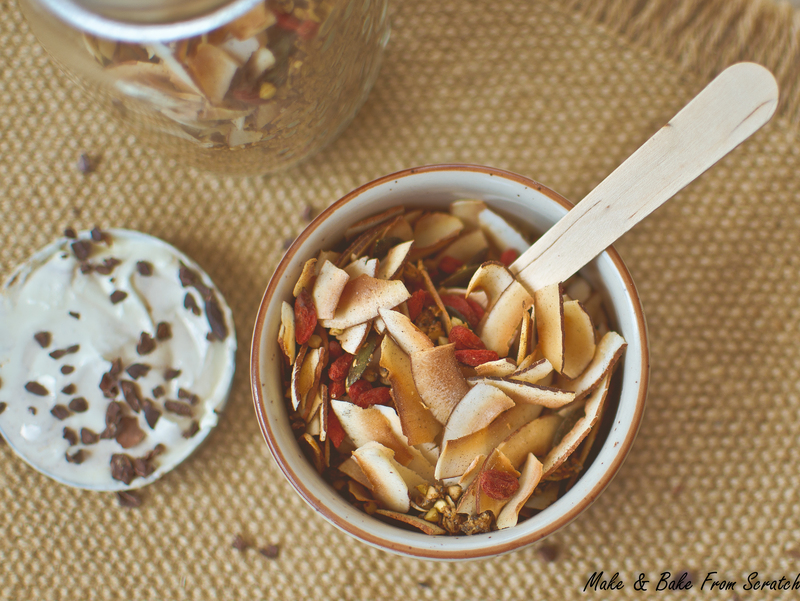 At the end I added roasted coconut chips, raw cacao nibs and goji berries. Other delights that would complement this flavoursome recipe are chia seeds, flaxseed, berries, vanilla powder, baobab powder, mesquite powder or a little sprinkle of coconut sugar. Get creative and nourish your body. Desiccated Coconut – good source of fibre, medium-chain triglycerides (MCTs) which help boost energy and potential to help towards weight loss ( be sure to follow a well-balanced eating regime). Buckwheat Groats (gluten-free) – is a fruit seed related to rhubarb it contains vitamin B3, B6, B5, Manganese and Magnesium. Further reading click Buckwheat. Pumpkin Seeds – Vitamin K, Manganese, Magnesium, Phosphorus, Zinc, Omega 3 & 6. Cinnamon – makes insulin more effective which will keep energy levels and sugar cravings balanced. Poppy Seeds – Iron, Phosphorus, Fibre and Linoleic Acid. Coconut Oil – medium-chain triglycerides (MCTs) these are medium in length and are metabolized differently in the body. They increase energy expenditure and the Lauric Acid present will help fight off bacteria or infections. I eat a teaspoon in the morning times off the spoon and works great as a moisturiser on your lips or hair treatment. In a large mixing bowl add all dry ingredients. Next, melt down the rice syrup and coconut oil together. I popped them in a bowl over a saucepan of boiling water to melt.